30/01/2011 - Auckland (NZL) - 34th America's Cup - AC45 sea trial n ° 8 - Anniversary day - Round Rangitoto Island. 31.01.11 After participating in the Auckland Anniversary Day regatta, a race that took competitors around Rangitoto Island in the Hauraki Gulf, ORACLE Racing skipper Jimmy Spithill was confident he’d shattered the speed record for the prototype AC45. Overnight analysis of the GPS logbook shows that confidence was justified. Spithill and crew topped out at 29.9 knots (approximately 34 MPH/55 km/h) in the race with winds blowing between 25 and 30 knots. Although one-tenth of a knot shy of the 30-knot barrier, the new speed record surpasses the 28-knot mark set by Murray “The Captain” Jones last week. When they got shoreside, some crewmembers thought that Jones had fiddled with the speedo, hindering its readings particularly off the wind. But there’s no denying the AC45 has speed to burn. 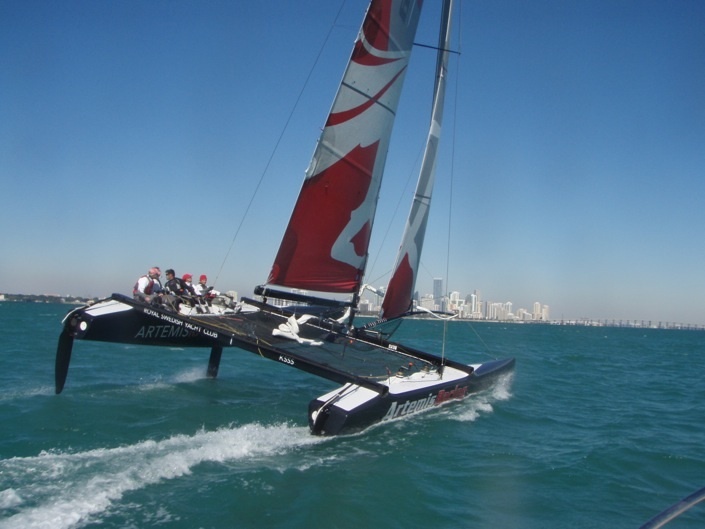 The AC45 surpassed 20 knots during its maiden voyage on Jan. 17. 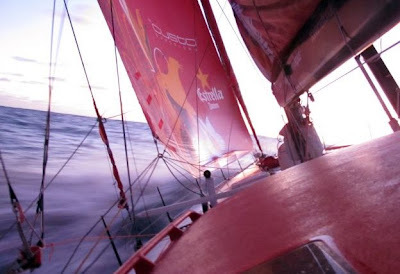 Two days later the crew was sailing comfortably at 25 knots. Then Jones set the 28-knot mark on Jan. 21. Today’s outing proved that the AC45 is capable of handling extreme conditions. View the gallery, ‘Testing the Limits’. 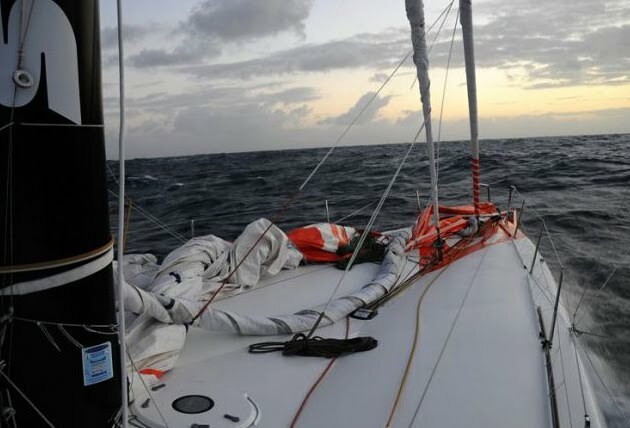 It was 5.56 am (Paris time) this morning when the Maxi Trimiran Banque Populaire V crossed the Equator, just 5 days 17 hours 44 minutes and 15 seconds since leaving Ushant. The maxi trimaran skippered by Pascal Bidegorry recorded the second fastest time in history on this section of the record attempt (Ushant to Equator). In doing so they have covered 3575 miles, at an average of 25.9 knots, keeping a slight advantage on the reference time of the Jules Verne. The crew is now recovering after a difficult crossing of the Doldrums and before the next challenging obstacle: The Saint Helena High. Crossing the equator is a not just a geographic area of note, but it also remains a true religion for sailors and the passage of this imaginary line has been celebrated as it should be on board the Maxi Banque Populaire V. The fourteen men have were glad to ease off the pressure they were under through the Doldrums and enjoy the mixture of superstition and tradition. 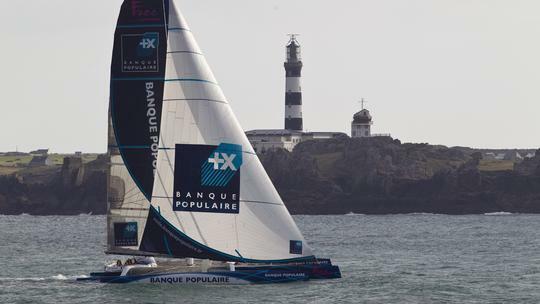 Getting through the Doldrums was not an easy task for the Maxi Banque Populaire V as the skipper, Pascal Bidegorry, explained: "It's liberating to get out of there! It was pretty tense yesterday as it is not obvious how to sail in under 2 tiny knots of wind! We should gradually reach better conditions and we are now sailing at 27 knots in 15-17 knots of wind with full mainsail and solent. The wind still oscillates a little, but should stabilize in few hours with a clearer sky.” Such conditions give the crew some time to recover a little, before having to tackle another tricky system. 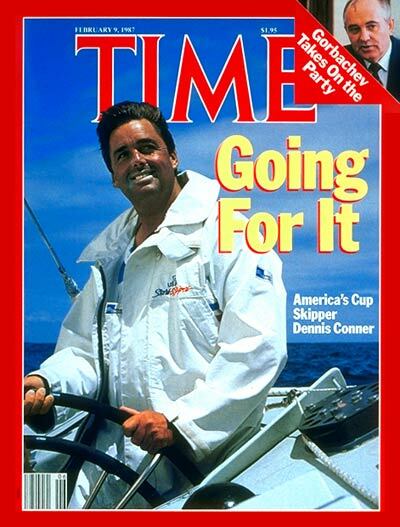 Tom Blackaller talks about having an America's Cup in SF on Catamarans back in the 1980's! The 2013 race dates for the Louis Vuitton Cup and America’s Cup Match (Finals) were confirmed today by Regatta Director Iain Murray. Since 1983, the Louis Vuitton Cup – the America’s Cup Challenger Series – has been held when more than one Challenger is vying for the right to race the Defender for the America’s Cup (as is the case for the 34th America’s Cup). The role of the Louis Vuitton Cup is twofold – not only to select the best Challenger, but also to help prepare that the team to race successfully against the Defender in the America’s Cup Match (Finals). The winner of the Louis Vuitton Cup will race the Golden Gate Yacht Club’s (GGYC) defending team in the finals, a first-to-win-five (best of nine) race series known as the America’s Cup Match (Finals). Under the Protocol Governing the America’s Cup, GGYC as the Defending Club has the responsibility to select the dates. The official notice of these dates to the currently entered six teams, and other prospective teams, from Regatta Director Iain Murray is now available at www.americascup.com under the Gallery section. *subject to the final number of Challengers and the precise format of the racing TBD by the Challengers and Regatta Director. **subject to the whether the America’s Cup Match (Finals) is won in five races, or goes the full nine races. The Metre yachts and Flensburg Fjord have always had a very special relationship, and next year it will reach new heights at the eighth Rolex Baltic Week, when both the Robbe & Berking 12-Metre World Championship and the Eights’ world cup will be held here. The event will even see His Royal Highness Harald V of Norway take part at the helm of his 8-Metre yacht “Sira”. In conjunction with Kieler Yacht-Club (KYC), Flensburger Segel-Club (FSC) will welcome the crème de la crème of these classic vessels – including those participating in the Robbe & Berking 6mR Sterling Cup – from 28 June to 3 July 2011. The 12-Metre owners first staged their World Championship in Gluecksburg in 2008 after the 8-Metres held their Euro Cup there in 2005. 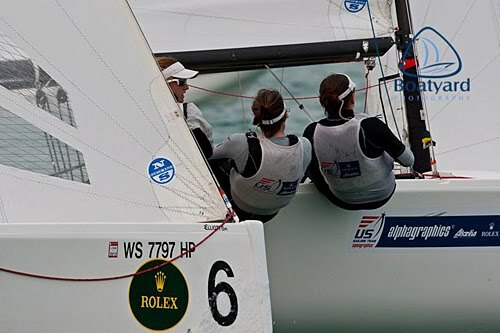 The first official entry for a sailing regatta is always very special, but when that entry is filed by a member of a European royal family, it instantly brings a little extra gloss to even a top class event. King Harald V of Norway, who has been known and loved for decades as an excellent offshore sailor and passionate competitor, will come to Flensburg Fjord from his Oslo Fjord home waters. Besides being the owner and helmsman of a number of top notch regatta boats named “Fram”, the Norwegian monarch will pay tribute to his love of classic boats by taking “Sira” (launched in 1938) with sail number NOR 33 to the starting line. Boat captain Kjell A. Myrann was responsible for dispatching the entry form for the seven-man crew skippered by the King, and he also announced a support boat. Whether it will be the Royal Yacht “Norge” who will come to the Rolex Baltic Week, remains as yet open. Norwegian insiders have let on that as many as three 12-Metre yachts might accompany their royal team to Flensburg. The competition for the Twelves – an America’s Cup class from 1958 to 1987 – will take place on familiar waters for Gluecksburg’s two gems. Both “Sphinx”, built 1939 and relaunched in 2008 following extensive restoration, and “Anitra” (1928), which has been returned to its former glory after an equally lengthy makeover, have chosen Flensburg Fjord as their home ground. This means that in the midst of this top-notch fleet, we will see an exciting intra-club duel in this majestic class. However, the number one favourite is “Nyala” (1938), with the American sail number US-12, which took the prize back in 2008. Owned by the Italian Prada boss Patrizio Bertelli, the Twelve is usually crewed by a professional team with America’s Cup experience. At the event two years ago, the fashion tsar beat “Trivia” (1937), belonging to Hamburg-based internet pioneer Wilfried Beeck. In 2010, “Trivia” won the Robbe & Berking 12mR Sterling Cup ahead of both “Sphinx” and Patrick Howaldt’s “Vanity V” (1936) from the Royal Danish Yacht Club Copenhagen (RDYC) in a thrilling conclusion to the Rolex Baltic Week. Also expected to go head to head are Hamburg’s “Heti” and “Erna Signe” from Sandefjord in Norway. Both ships belong to the “Antique” division, meaning they date back to the early days of the Metre classes. The grand old lady from Norway will be celebrating her 100th birthday next year. What could be better than taking part in the World Championship to mark the occasion? Not to be outdone by “Heti”, “Erna Signe” is a mere 99 years old. “Heti’s” design and gaff rig sail plan alone give away her age, however, as the vessel has undergone years of restoration by the Hamburg Maritime Association as part of its youth training project “Jugend in Arbeit”. She has been back on the water with her historic rigging for several years. Flensburg won over the race organisers from the International Eight Metre Association (IEMA) to be selected as their World Championship hosts, ahead of bids from France and Italy. “The 8-Metre class association was delighted to accept the FSC’s offer to host the World Cup. 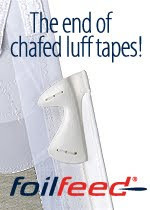 We were very impressed by our positive experiences both back in 2005 and at the Euro Cup during the Rolex Baltic Week 2010,” said Andreas Lochbrunner from Lindauer Segler-Club, who welcomed the fleet of Eights in 2006 for the World Championship on Lake Constance. He also praised the smooth collaboration between the two host clubs, FSC and KYC. Lochbrunner, who is the owner of the 8-Metre “Elfe”, expects a large fleet of at least 15 boats to enter the Flensburg Fjord event. “With the Twelves holding their World Championship at the same time, the only problem is that it is more difficult for some owners to take part as they are active in both classes. We will do our best to organise charters to help out,” Lochbrunner promises. He certainly plans to enter with his unusual boat – the smart Abeking & Rasmussen design is the only double-masted Eight. The ketch also features a rare wishbone rig. Once again, “Elfe” will face Richard Gervé’s “Sposa” in a Lindauer SC intra-club contest. Like “Elfe”, the gaff-rigged yacht was constructed in 1912 and is therefore classed in the First Rule division (vessels built between 1907 and 1919). Following the Rolex Baltic Week 2010, “Sposa” stayed up north, meaning she will be ready to race in 2011 without the need for land transport. Andreas Lochbrunner hopes that other First Rule division yachts will enter the competition. They could include “Lucky Girl”, built by William Fife III, which was completed in 1910 and is now shipshape again following refurbishment. Owned by Siegfried Buss, she sails under the British flag but is berthed on Lake Constance. 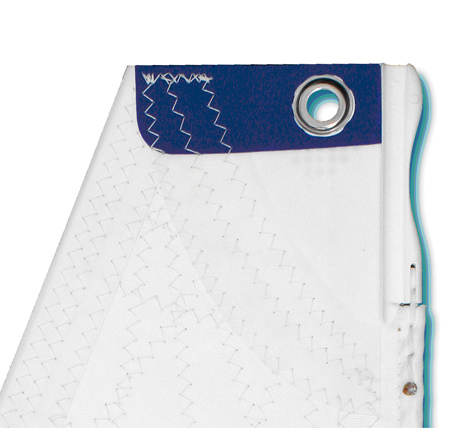 Another candidate, “Edit” belonging to Wilhelm Wagner from Bodman, will turn 100 next year. She was also built in Finland in 1911 based on a design by Alfred Mylne for the Olympic Games, which were held in the Swedish capital Stockholm in the following year. 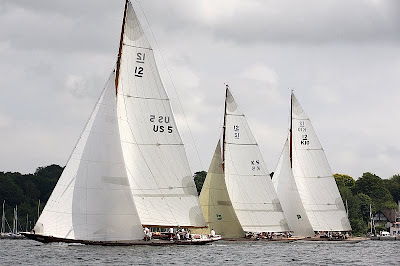 “Classic” Eights (vessels built between 1920 and 1966) will make up the largest division. “We fully expect to see a number of ships from Scandinavia. There are lots of classic Eights in Finland alone,” explains Lochbrunner. It goes without saying that the “Modern” 8-Metre yachts (built between 1967 and the present day) are expected to be the fastest on the regatta course. The organisers expect a field of three or four modern vessels in this attractive, classic design to pit themselves against their historic predecessors. Favourites include the Swiss “YQuem II” owned by Jean Fabre, which triumphed at the 8-Metre Euro Cup in summer 2010 during the Rolex Baltic Week in Kiel. Her greatest competitor is expected to be Iris Metten’s “Aluette” (constructed in 1995 and also from Switzerland), which bagged a third World Championship title in Toronto, Canada in 2010 – assuming the yacht is transported back to Europe from North America. The Franco-German team, managed by Jochen Schümann, becomes “Audi Sailing Team powered by ALL4ONE”, following a new three-year agreement reached with title partner Audi. 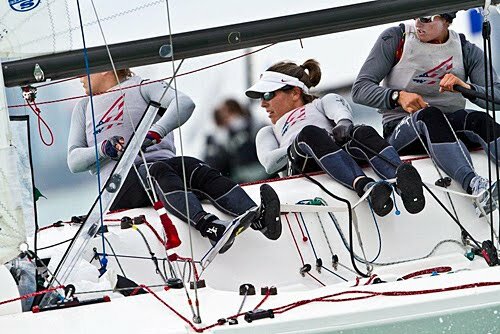 The team have confirmed the build of a new TP52 in Sydney, with which they aim to finish among the podium positions on both the Audi MedCup Circuit and at TP52 World Championship. 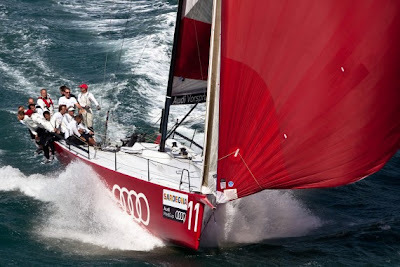 ALL4ONE introduce both a new name and a new boat in 2011 as a result of reaching a sponsorship agreement with main sponsor, Audi. The campaign, led by France’s Stephane Kandler, will be known as “Audi Sailing Team powered by ALL4ONE”. 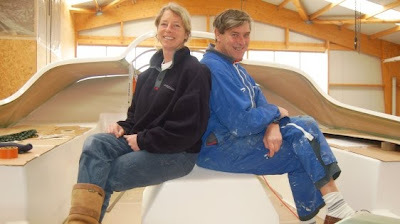 The team have confirmed they are building a new TP52 designed by Judel/Vrolijk at McConaghy in Sydney, Australia. Their objective is to finish the 2011 season on the Audi MedCup Circuit in a top three overall position, and then will compete on the TP52 World Championship in October. The new boat launch is expected to take place in Valencia in May in time for the boat to be ready for training prior to the first Audi MedCup Circuit competition event. "First, we are pleased that the new Audi contract allows us to take part next season in the Audi MedCup Circuit. With the new TP52 our goal is to finish among the top three in the overall standings and win one of the season’s five events," said the German skipper. "Jochen Schumann (GER) will be our skipper and Sebastien Col (FRA) will continue as tactician. There is no reason to make big changes. The three-year collaboration with Audi and their confidence in our capabilities is great news for "ALL4ONE" and all this allows us to work in ideal conditions: continuity, a permanent base in Valencia, a media agreement and a competitive boat. This is the recognition of a great new team in 2010," said Kandler, whose team will continue to enjoy the support of the French television group, Canal +, partners since 2004, by following of Kiel Woche, the 2011 Audi MedCup Circuit and TP52 World Championships. "ALL4ONE" is a pan-European team founded and directed by Stephan Kandler, ex-crew member of the French America's Cup syndicate K-Challenge, and Jochen Schumann, triple Olympic gold medalist and double America’s Cup winner, with crews members from France, Germany, Switzerland, Spain, Holland and Italy. 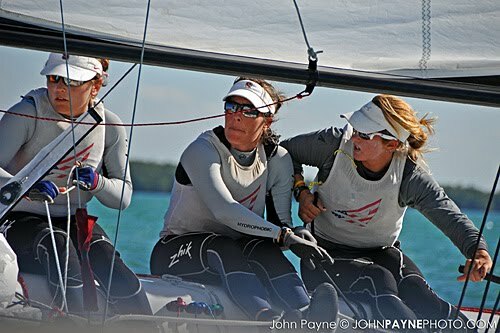 Miami, FL - We have just gotten home from a late day of sailing, finishing up day 1 of US SAILING’s Rolex Miami OCR. Group C completed three races this afternoon hitting the dock at 6pm. We had a good day finishing with three wins in our three races. It was a beautiful day, cloudy, but the wind was up around 12-15kts and mostly flat water. The temperature was in the high 60's/low 70's which made it very pleasant. The day had a very relaxed start for us. We were not scheduled to race until the other two groups had completed three races each, which meant that we didn't have to leave the house until 12:30pm. We left and got to the club in time, changed and headed out to watch two of group B's races. We wanted to head out so we could see what the wind was doing on the race course to help get us clued in for when it was our turn. We finally got into our boats, and after a bit of time to get ready we started racing. Our closest match was the last race against Sweden's Anna Kjelberg. In the prestart, we gave her a penalty, we maintained control and led her off the line. Up the first beat we were within half a boat length for a while and then we correctly hit a couple of shifts at the top to extend to a two length lead. Downwind, we sailed the shifts but coming into the leeward mark, Kjelberg rode a puff into us and rounded half a length behind us. Upwind again, we extended on the shifts and continued to increase our lead downwind to cross the line to take the win. At this point the sun was about 30 minutes from setting so the race committee sent us in for the day. 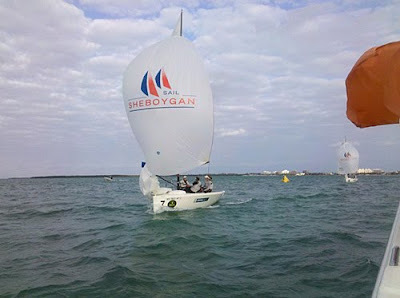 Tomorrow's racing starts at 9:30 for the match racers. Group B will start the day, and we will race second. The plan is for the RC to wrap up the round robins which means four flights for each group. Luckily the forecast is for 10-20kts tomorrow so there should be no problem in getting the races in. There will be live twitter feeds online with updates. You can find results at the regatta website here. The boat and the crew have been set for weeks. They set off this morning from the Port du Chateau in Brest and crossed the start line off Ushant at 11h11m45sec (UTC) for the Maxi Trimaran Banque Populaire’s first attempt on the Jules Verne Trophy. Pascal Bidegorry and his 13 crew have to be back in less than 48 days, 7 hours, 44 minutes and 52 seconds in order to beat the record time established by Groupama 3 in March 2010. It was just before 9 am this morning when the Maxi Trimaran left the dock, in the Port du Chateau in Brest. Between the excitement of leaving and the emotion of leaving families, the moment was really intense for the 14 crew. Extremely focused on attacking this first attempt, the skipper Pascal Bidegorry is happy about leaving today, even though the weather conditions are not that clear: «we will be leaving downwind and sailing around a depression. Below this depression, we cannot hide from the fact that the forecast is not straight forward. However, we have been waiting for this moment for a long time and we cannot let this opportunity go. I am really excited to be going to sea and I really think that we deserve it. I am looking forward to tomorrow morning, tomorrow night or in two days time and realising: “that’s it ! We’re there!”. These stand-by periods are somewhat painful and I am really looking forward to saying that we are in the Jules Verne Trophy, the objective of the past four years. This is a great moment in my life. " 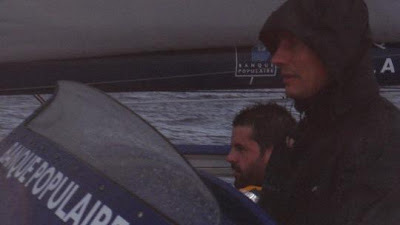 It will be no mean feat for the Skipper, Pascal Bidegorry and his 13 crew onboard Banque Populaire V, and for them the 10th March will be highlighted in their diaries as the date to aim for as they attempt to sail into the record books.